fix for Hong Kong’s meat lovers. For a restaurant to survive, it either has to keep wowing customers with new and interesting additions to their menu, or stick to a tried and tested formula it excels in—for La Vache, it’s the latter. 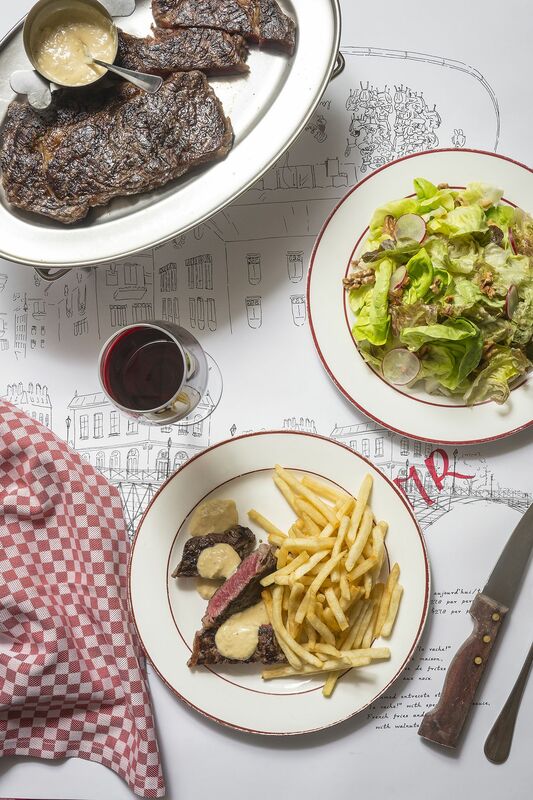 Their menu is incredibly straightforward: a salad, sprinkled with walnuts and tossed in a refreshing and slightly tangy dressing, followed by a pre-cut succulent l’entrecote steak cooked exactly to your liking and accompanied by a seemingly endless heap of crispy golden fries. Leave room for dessert, as the roving dessert trolley offers a varied range of sweet treats on hand, from lemon meringue pies to an indulgent giant macaron served with a dollop of whipped cream and fresh berries. Service is consistently friendly, and the ambience warm and homey enough that it makes La Vache an easy choice for unwinding after a long day, with a glass (or two) of wine and a no-frills, hearty, and comforting steak meal. While the fries are excellent on their own, drizzling (or drenching) them with the steak sauce ups the game considerably.